About: All you need to know about how the Church of Ireland has embraced the Irish Language over the centuries. This book, published by the Irish Guild of the Church of Ireland and written in Irish, traces the history of the use of the Irish Language in the Church of Ireland up to the twentieth-century. Contents: Buíochas – Brollach – Réamhfhocal — An Mhocheaglais – Lámhschríbhiní agus Scoileanna na Manach — Cailliúint an Neamhspleáchais: Brú ar na nGaelige — Ré Éilíse — Ábhar scríofa tri Ghaeilge – Tiomna Nua Uí Dhomhnaill — Coinnealbhá Éilíse — Bunú Choláiste naTríonóide — Aistriú an Leabhar Urnaí le Uilliam Ó Domhnaill — An Ghaeilge i gColáiste naTríonóide — Bedell — Údarás na hEaglaise I gcoimhlint le Bedell — Comhthionól Eaglaise 1634 agus an 28ú d’Anraoi VIII — Patrick Dunkin – Reachtaire i nDomhnach Mór, Condae an Dúin — Polasaí an Ghalldachais san Eaglais — Polasaí Iompaitheoireachta: John Richardson – Reachtaire ar pharóiste Anna nó Béal Tairbert — Hugh Boulter mar phríomháidh ag ullmhú d’Eaglais Aontaithe Shasana agus Éireann — Bunú an Chumainn chun oideachas a chur chun cinn i measc bhochtáin na hÉireann sa bhliain 1811 (An Cumann Phlás Chill Dara) — An Irish Society — Bille Oideachais Stanley 1831 — An ‘Society for the Preservation of the Irish Language’ agus Tomás Ó Néil Ruiséil — Euseby Cleaver – Maxwell Close – Conradh na Gaeilge – Seirbhísí trí Ghaeilge: An tUrramach James Hannay: Déan Bernard – Ó Casey; Blythe; Irvine; Deacon – Bunú Chumann Gaelach na hEaglaise – An Crinniú bunaidh 29.4.14 agus Cuspóirí an Chumainn – Aidhmeanna an Chumainn á gcur i gcrích; An ceangal leis an Mhocheaglais: Ranganna do lucht foghlama na Gaeilge – An Scoilt sa chumann ‘Comhluadar Gaodhalach na Fiadhnaise’ – An Eaglais in amhras faoin gCumann: Seoirse de Rút – Bunú an ‘tEaglaiseacht Gaodhalach’. An Cumann gníomhach i gcúrsaí eaglasta agus i gcúrsaí náisiúnta – An scoilt leigheasta: Aidhmeanna an ‘Gaelic Churchman’ – An tUrramach Canónach Willis mar Uachtarán ar an gCumann – Fáilte mhór d’ Eamonn de Valéra – An tArdeaspag J.A.F. Gregg ina chara maith don gCumann – Polasaí an Chumainn i leith na Gaelige éigeantaí: Bunú Choláiste Moibhí – Bás Neilí Uí Bhriain agus Deireadh leis an Gaelic Churchman – Am daingnaithe agus neathaithe don Chumann: Dearcadh ní ba dhearfaí i leith na Gaelige – Leas-Uachtarán an Chumainn ina Uacharán ar Éirinn 1938 – An Teampall Molyneux: An ‘K’ Club: An Buachaillín Buí – Eaglais dá gcuid féin ag an gCummann – Eaglais Naomh Finghin – Cinneadh chun Leabhar Urnaí Nua agus Leabhar iomann nua a gcur i gcló – An Cinneadh chun éirí as Eaglais Naomh Finghin: Dhá mhórshaothar curtha i gcrích – Tosach na Seascaidí – Deireadh na Seascaidí – Éarlaimh agus Oifigigh an Chumainn 1970: Flaithiúlacht an Chumainn: Feachtas bolscaireachta dírithe ar na Scoileanna – Seirbhísí Lá ‘le Pádraig: Seirbhísí Éacuiméineachta: Dónal Fíoroirmh. Caird ina Uachtarán ar an gCumann – Easpa ministéirí le cumas Gaeilge: Móréachtaí Chosslett Uí Chuinn ar son an Chumainn – An Chríoch – Leabharliosta. WW Connection #1: The author, Risteárd Giltrap hails from Glashina, near Blessington. Extra #3: Contains many black and white photographs and illustrations. Extra #4: This book won a prize in Comórtas an Oireachtais 1989. Extra #5: Cumann Gaelach na hEaglaise – the Irish Guild of the Church of Ireland was founded 100 years ago today. Comhghairdeas! Visit their website and their Facebook Page. Publisher / Place of Publication: Currach Press / 55A Spruce Avenue, Stillorgan Industrial Park, Blackrock, Co. Dublin. 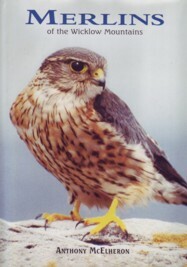 About: A study of the smallest falcon species in Ireland. The book concentrates on a pair of birds based in the Wicklow Mountains and is a delightful natural history of both the bird and its surroundings. Many years of observation went into the making of this labour of love which showcases one of our most secretive birds. Chapters: Acknowledgements – Preface – Background – The Children of Duff Hill: a Chronology – Winter Survival – Mixed Woodlands – Some Site Notes — The Future – Picture Credits – Index. WW Connection #1: Who cares if they are West Wicklow birds or not? They are welcome in West Wicklow anytime! Extra #3: Includes several colour photographs and a map of merlin breeding sites in Co. Wicklow. Publisher / Place of Publication: Maureen Phibbs, Irish Roots Media Ltd., / Blackrock, Blessington, Co. Wicklow. About: A description of a genealogical project which details the occupiers of all the houses that existed within the parish of Hollywood between the time of Griffiths Valuation in 1852 until the Census of 1911. The project was exhibited at the Hollywood Fair in 2013 as part of the activities related to ‘The Gathering’. WW Connection #1: Irish Roots Magazine is published in Blessington in West Wicklow. Extra #1: Includes some colour photographs and a sample table of information.